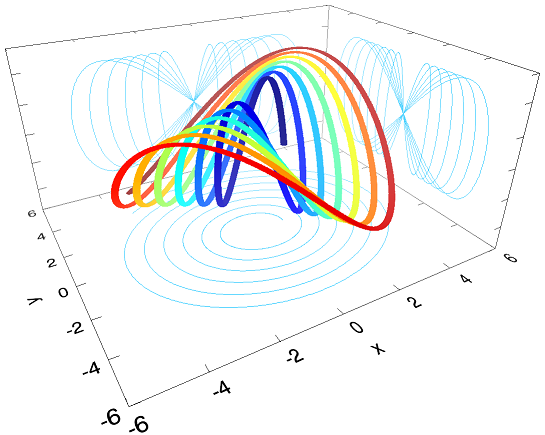 The PLOT3D function draws a three-dimensional plot of vector arguments. The following lines create the plot shown at the top of this topic. ; Hide the three axes in the front. See Plot examples for additional examples using the PLOT3D function. Keywords are applied only during the initial creation of the graphic. Properties can be set as keywords to the function during creation, or retrieved or changed using the "." notation after creation. The PLOT3D function returns a reference to the created graphic. Use the returned reference to manipulate the graphic after creation by changing properties or calling methods. Vectors giving the x, y, and z coordinates of the plot. Tokens in the Format string represent values of the LINESTYLE, COLOR, THICK, and SYMBOL properties. From one to four tokens can be present, and the tokens may be in any order. Tokens are case sensitive. For more information about the syntax of the Format argument, see Formatting IDL Graphics Symbols and Lines. 0 - No axes. Decrease the margins so the graphic almost fills the window. This is the default for images. 1 - Single X, Y (and Z if 3D) axes located at the minimum data value. The margins will be adjusted to leave space for the axes. This is the default for 3D graphics. 2 - Box axes - multiple axes located at both the minimum and maximum data values. The margins will be adjusted to leave space for the axes. This is the default for 2D graphics. 3 - Crosshair-style axes - located at the midpoint of each data dimension. Since the axes are in the middle, decrease the margins so the graphic almost fills the window. This is the default for polar plots. 4 - No axes, but use the same margins as if axes were there. This is useful if you want to later add another graphic that does have axes, and you want the two visualizations to be aligned properly. A string or RGB vector containing the axis color. A string, integer, or 2-element vector giving the linestyle for tickmarks. Set to 1 if the axis is logarithmic. The minimum value of the axis range must be greater than zero. The number of major tick marks. Set to -1 to auto-compute, set to 0 to suppress. The number of minor tick marks. Set to -1 to auto-compute, set to 0 to suppress. A string, integer, or 2-element vector giving the linestyle for the minor tickmarks. The default is 0, for solid lines. Set to -1 to force minor ticks to have the same linestyle as major ticks. Set to 1 to show text labels or 0 to hide the text labels. (0) Nice range. Default for all graphics except Image, Barplot, and Map. (1) Force the exact data range. Default for Image, Barplot, and Map. (2) Pad the axes slightly beyond the nice range. (3) Pad the axes slightly beyond the exact data range. The [XYZ]RANGE takes precedence over this property. The ratio of the minor tick length to the major tick length. The default is 0.5. A string or RGB vector containing the axis text color. The angle (in degrees) of the tick mark labels. Set to 1 to position text above the axis. The default is 0, below the axis. Set to a floating-point value between 0 and 10 to specify the line thickness for tickmarks. A thickness of 0 gives a thin hairline. The default is 1. Set to 1 to draw the tickmarks facing outwards. The default is 0, facing inwards. A string containing the font name for the axis text. The axis text size in points. A string or integer containing the font style: normal (0), bold (1), italic (2), or bold italic (3). A string or string array of tick label formats. See Format Codes for more information. The interval between major tick marks. Set to 1 to suppress tick marks; set to 2 to draw a box around the tick labels. The length of each major tick mark, normalized to the width or height of the graphic. The default value is automatically calculated based upon the aspect ratio of the graphic. A string array containing the tick labels. A string giving the tick units. Valid values are: null (the default, signified by empty quotes), Years, Months, Days, Hours, Minutes, Seconds, Time, exponent for exponential notation, or scientific for scientific notation. If any of the time units are utilized, then the tick values are interpreted as Julian date/time values. If more than one unit is provided, the axis will be drawn with multiple levels. An array of tick mark locations. A string giving the axis title. An integer from 0-100 giving the percent transparency. For more detailed explanations of these properties, see the AXIS function. Tip: You can also use the AXIS function to insert additional axes after the graphic has been created. Set this keyword to 1 to direct the graphics to an off-screen buffer instead of creating a window. Set this keyword to create the graphic in the current window with a new set of axes. If no window exists, a new window is created. The WINDOW's SetCurrent method may be used to set the current window. Or, set this keyword to an existing IDL Graphic reference to make that window be the current window and direct the new graphic to that window. Tip: The CURRENT keyword is usually used with the LAYOUT keyword or POSITION property to produce a window which has multiple graphics in different locations. Tip: For the graphic share the same axes as an existing graphic, use the OVERPLOT keyword instead. Set this keyword to a two-element vector of the form [width, height] to specify the window dimensions in pixels. If you do not specify a value for DIMENSIONS, IDL by default uses the values of the IDL_GR_WIN_HEIGHT and IDL_GR_WIN_WIDTH preferences for Windows platforms or the IDL_GR_X_HEIGHT and IDL_GR_X_WIDTH preferences for X Windows systems on UNIX. Tip: The minimum width is set by the toolbar in the window, usually around 400 pixels. To create a smaller graphics window, use the NO_TOOLBAR keyword. Set this keyword to a three-element vector [ncol, nrow, index] that arranges graphics in a grid. The first dimension ncol is the number of columns in the grid, nrow is the number of rows, and index is the grid position at which to place the graphic (starting at element 1). This keyword is ignored if either OVERPLOT or POSITION is specified. Set this keyword to a two-element vector [X offset, Y offset] giving the window's screen offset in pixels. Set this keyword to the current graphic’s margin values in the layout specified by the LAYOUT property. Use a scalar value to set the same margin on all sides, or use a four-element vector [left, bottom, right, top] to specify different margins on each side. By default, margin values are expressed in normalized units ranging from 0.0 to 0.5. If the DEVICE keyword is set, the values are given in device units (pixels). This keyword is ignored if either OVERPLOT or POSITION is specified. By default the graphics window will have a toolbar containing some common tools such as Print and Save. Set this keyword to remove the toolbar. This keyword has no effect if the window is already created. Tip: When the toolbar exists, the minimum window width is set to the toolbar's width, usually around 400 pixels. To create a smaller graphics window, use the NO_TOOLBAR keyword. Set this keyword to 1 to create the graphic, but without any data attached to it. The axes and title (if present) are also created and displayed. If the OVERPLOT keyword is specified, axis ranges will not change. Note: You must still provide valid input arguments. The data range of the input arguments are used to automatically set the range of the axes. The [XYZ]RANGE properties may be used to override these default ranges. Set this keyword to 1 (one) to place the graphic on top of the currently-selected graphic within the current window. The two graphics items will then share the same set of axes. If no current window exists, then this keyword is ignored and a new window is created. If you have a graphic in another window that is not currently selected, you can also set this keyword to that graphic's reference to overplot on top of that graphic. Tip: For the graphic to have a new set of axes, use the CURRENT keyword instead. By default, when running from the IDL Workbench, the graphics window will use the native widgets for your platform. Set this keyword to instead use IDL widgets for the graphics window. This keyword is ignored when running from the IDL command line, since IDL widgets are always used in that case. Set this keyword to a two-element vector [bright, dim] specifying the near and far planes for depth cueing, in normalized units. Depth cueing causes graphics objects that are further away to fade into the background. The first element is where the fade starts to take effect, while the second element is where the objects are completely transparent. Negative values are closer to the eye, while positive values are farther from the eye. The default value is [0, 0] which disables depth cueing. A typical value would be [0, 1], which would cause objects to start to fade at the mid-plane of the window, and completely fade out at a normalized eye distance of 1. Set this keyword to 1 to enable a perspective graphics projection. In the perspective projection, objects that are further away will appear smaller. The default is 0, which is the orthogonal perspective. By default anti-aliasing is used when drawing lines. Set this property to 0 to disable anti-aliasing. A floating point value indicating the ratio of the Y dimension to the X dimension in data units. If this property is set to a nonzero value, the aspect ratio will be preserved as the graphic is stretched or shrunk. The default value is 0 for all graphics except images, meaning that the aspect ratio is not fixed, but is allowed to change as the graphic is stretched or shrunk. For 3-D graphics, a floating point value indicating the ratio of the Z dimension to the X and Y dimensions, in data units. If this is a nonzero value, the aspect ratio will be preserved as the graphic is stretched or shrunk. The default value is 0, meaning that the aspect ratio is not fixed, but is allowed to change as the graphic is stretched or shrunk. See AXIS for a list of the available properties. Set this property to a string or RGB vector indicating the graphic's background color. The default value is [255, 255, 255] (white). Set this property to a scalar value to remove the background color. Tip: To set the background color of the entire window, retrieve the window object using the WINDOW property, and set the BACKGROUND_COLOR on the window object. Set this property to an integer between 0 and 100 giving the percent transparency of the background color. The default is 100 (completely transparent). Note: If the BACKGROUND_COLOR property is changed, and the current background transparency is 100, then the BACKGROUND_TRANSPARENCY will be automatically set to 0 (opaque) so that you can see the new color. Set this property to 1 to clip portions of the graphic that lie outside of the dataspace range, or to 0 to disable clipping. The default is 1. Set this property to a string or RGB vector that specifies the color of the plot line. Note: When you retrieve the COLOR property, the returned value will always be a three-element RGB vector, regardless of how the color was initially specified. Use this property to retrieve a reference to the Crosshair graphic. All graphics objects within the same set of axes share a single Crosshair graphic. For Plot graphics the default behavior is to display the crosshair when a Mouse_Down event is received. For other graphics the crosshair is disabled. The STYLE property may be used to automatically draw the crosshair, while the LOCATION property may be used to manually draw the crosshair. Set to 1 to enable anti-aliasing for the lines. A string or RGB vector containing the color. Set to 1 to hide the crosshair, 0 to show. Set to 1 to force interpolation between Plot data points when SNAP is active. For other graphics this property is ignored. The default is 0. An integer or string giving the line style. The default is 'dot'. See Linestyle Values for additional options. The location at which to draw the crosshair. For Plot graphics, if SNAP is enabled, then only the X coordinate needs to be supplied. Otherwise, LOCATION should be set to a two-element vector [X, Y] for two-dimensional graphics or [X, Y, Z] for three-dimensional graphics. If STYLE is currently "None", then setting the LOCATION will automatically set the STYLE to "Manual". The name of the graphic. Set to 1 to snap the crosshair to the nearest Plot data point. For other graphics this property is ignored. The default is 1. 0 - "None" - never draw the crosshair. This is the default for all graphics except 2D plots. 1 - "Manual" - draw the crosshair using the LOCATION property. 2 - "Auto" - automatically draw the crosshair. This is the default for 2D plots. The thickness of the lines. The default is 1. The percent transparency of the lines. The default is 50. An IDL variable of any data type. See Creating Functions to Control Mouse Events for a more detailed crosshair example. A floating-point value that specifies the distance from the eyepoint to the viewplane (Z=0). The default is 4.0. The eyepoint is always centered within the viewplane rectangle. IDL converts, maintains, and returns this data as double-precision floating-point. Set this property to a string or RGB vector that specifies the text color for the title and axes (if present). The default value is "black". Set this property equal to a string specifying the IDL or system font for the title and axes (if present). The default value is "DejaVuSans". Set this property equal to an integer specifying the font size for the title and axes (if present). The default value is 9 points for the axis text and 11 points for the title. Set this property to 1 to hide the graphic. Set HIDE to 0 to show the graphic. Set this property to 1 to connect each point with horizontal and vertical lines. The horizontal lines start at the X location of each point and extend to the next X location. This property is useful for displaying information with discrete or non-linear data, where the X values are typically non-integer bin locations and the Y values represent the "count" of values within each bin. See the STAIRSTEP property for centered bars. Tip: You can also use the BARPLOT function to create a plot with vertical or horizontal bars. Set this property to an integer or string specifying the line style. The following table lists the index values, strings, and characters you can use with the LINESTYLE property, and the equivalent characters and strings you can use in the Format string argument. Note: If you use the LINESTYLE value or Format string '-. ', the linestyle is set to dash-dot and the plot symbol is not set. Note: You can also set LINESTYLE to a two-element vector, [repeat, bitmask], specifying a stippling pattern. The repeat indicates the number of times that individual bits in the bitmask should be repeated. (That is, if three consecutive 0’s appear in the bitmask and the value of repeat is 2, then the line that is drawn will have six consecutive bits turned off.) The value of repeat must be an integer between 1 and 255. The bitmask indicates which pixels are drawn and which are not along the length of the line. The bitmask should be specified as a 16-bit hexadecimal value. For example, LINESTYLE = [2, 'F0F0'X] describes a dashed line (8 bits on, 8 bits off, 8 bits on, 8 bits off). A string that specifies the name of the graphic. The name can be used to retrieve the graphic using the brackets array notation. If NAME is not set then a default name is chosen based on the graphic type. Set this property to a four-element vector that determines the position of the graphic within the window. The coordinates [X1, Y1, X2, Y2] define the lower left and upper right corners of the graphic. Coordinates are expressed in normalized units ranging from 0.0 to 1.0. On creation, if the DEVICE keyword is set, the units are given in device units (pixels). Note: After creation, you can set the POSITION to either a two or four-element vector. If two elements are provided, the center of the graphic will be translated to that position. If four elements are provided, the graphics will be translated and scaled to fit the position. The number of the predefined IDL color table, or a 3 x 256 or 256 x 3 byte array containing color values to use for vertex colors. If the values supplied are not of type byte, they are scaled to the byte range using BYTSCL. Use the VERT_COLORS property to specify indices that select colors from the values specified with RGB_TABLE. Set this property to a string or RGB vector that specifies the color of the shadow lines. The default is "gray". Set this property to a string or RGB vector that specifies the color for the plot symbol. If this property is not set then the symbol color will match the COLOR. Set this property to 1 to fill the symbols. Set this property to a string or RGB vector that specifies the color for the filled portion of the symbol. If this property is not set then the symbol fill color will match the SYM_COLOR. Set this property to an integer value specifying the number of plot vertices between symbols. The default value is 1, which places a symbol on every vertex. Set this property equal to an object reference to be used for the plotting symbol. The SYM_OBJECT may be either an IDLgrModel object or an atomic graphics object. A floating point value specifying the size of the plot symbol. A value of 1.0 produces a symbol that is 10% of the width/height of the plot. A floating point value from 1.0 to 10.0 that specifies the thickness (in points) of the plot symbol. An integer between 0 and 100 that specifies the percent transparency of the symbols. The default value is 0. Note that symbol names of more than 1 character are case insensitive, while single-character names are case sensitive. Set this property to a value between 0 and 10 that specifies the plot line thickness. A thickness of 0 displays a thin hairline on the chosen device. The default value is 1. Set this property to a string specifying a title. The title properties may be modified using FONT_COLOR, FONT_NAME, FONT_SIZE, and FONT_STYLE. After creation the TITLE property may be used to retrieve a reference to the title text object, and the TEXTproperties may be used to modify the title object. You can add Greek letters and mathematical symbols using a TeX-like syntax, enclosed within a pair of "$" characters. See Adding Mathematical Symbols and Greek Letters to the Text String for details. An integer between 0 and 100 that specifies the percent transparency of the plot line. The default value is 0. Set this property to an IDL variable of any data type. A vector of indices into the color table for the color of each vertex (plot data point). Alternately, a 3 x N byte array containing vertex color values. If the values supplied are not of type byte, they are scaled to the byte range using BYTSCL. If indices are supplied but no colors are provided with the RGB_TABLE property, a default grayscale ramp is used. If a 3 x N array of colors is provided, the colors are used directly and the color values provided with RGB_TABLE are ignored. If the number of indices or colors specified is less than the number of vertices, the colors are repeated cyclically. Note: VERT_COLORS can be an array of RGB triplets or RGBA colors. This property retrieves a reference to the WINDOW object which contains the graphic. Set this property to the title of the IDL Graphic window. The title is displayed in the window's title bar. Set this property to 1 to turn on the plot shadow in the XY plane. Set this property to 1 to turn on the plot shadow in the XZ plane. Set this property to 1 to turn on the plot shadow in the YZ plane. A two element floating-point vector representing the near and far clipping planes to be applied to the objects in this view. The vector should take the form [near, far]. By default, these values are [1, -1]. IDL converts, maintains, and returns this data as double-precision floating-point. Added AXES, BACKGROUND_COLOR, BACKGROUND_TRANSPARENCY, CLIP properties. [XYZ]TICKUNITS accepts exponent as a value. Change POSITION from a keyword to a property. Added the ability to use a stippling pattern for LINESTYLE. 8.6 Changed default font name and font size.